Office and warehouse fires spread quickly and can have devastating consequences. In addition to a proper alarm system, an understanding of how and why fires start is a key step in fire prevention. There are many factors that can make your building more vulnerable to fire, and it’s important that both building owners and staff members recognize these vulnerabilities so they can exercise extra caution when necessary. This is number one for a reason. It’s common knowledge that cooking is the leading cause of home fires, but did you know that it’s also a major contributing factor to annual commercial building fires, as well? It’s also a major player in fire related injuries such as burns and smoke inhalation. 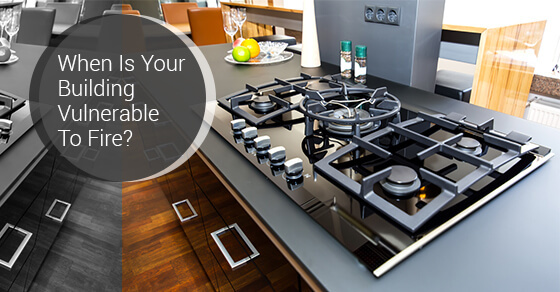 Keep appliances, oven and stove top clean: Avoid buildup of grease, oil, crumbs, and any other flammable materials. Be extra careful with grease: Grease can catch fire if it overheats. Take extra care when cooking with grease and oil. In case of a grease fire, do not use water to put it out. Turn off the heat and cover the fire with a metal lid if possible, as lack of oxygen flow will put the fire out. Keep flammable items far from heat: We use many flammable items in the kitchen, such as paper towel, plastic wrap, oven mitts, and dish towels. Take care to keep these items far away from any sources of heat, especially burners. Install working smoke detectors on every floor of your building, especially near entrances where smokers are likely to light up. Get a proper cigarette disposal units installed near the dedicated smoking areas, and always make sure that staffers are completely extinguishing cigarettes before reentering the building. Don’t leave lit cigarettes or cigars unattended. Mind your tree: While some offices choose to not celebrate any one religion, it’s still quite common to see a Christmas tree adorning reception or lobby areas. Ensure that someone is responsible for keeping the Christmas tree watered, as they can become extremely flammable if dry. Make sure any lights are in good condition, and none of the cords are damaged or frayed. Keep the tree away from any sources of heat such as space heaters that some staffers may have. Supervise the kitchen: With more activity in holiday potlucks, it’s easy to get distracted while cooking. Make sure someone is always watching cooking food. Blow out your candles: If the staff of your office are using candles as a festive decoration, make sure they are completely extinguished each time they leave the building. A proper alarm system is the essential first step when it comes to fire prevention. You can never be too careful when it comes to protecting your property. Contact us today, and learn how our fire monitoring system can keep you and your loved staff safe.